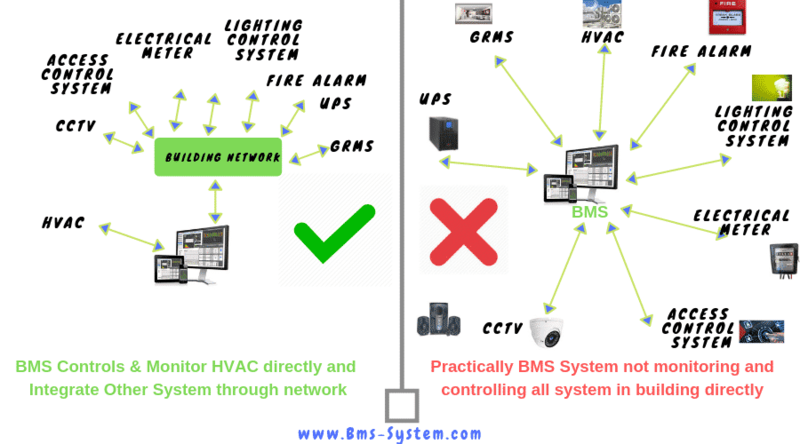 What is a BMS or Building Management System? In a nutshell, BMS otherwise called as BAS or building automation is computer-based control system which reduces the manpower, automate the system, and saving the energy consumption in building by monitoring and controlling the mechanical and electrical equipment in modern day buildings or any industrial plants. increasing the equipment lifetime and better performance. Identifying the systems faults earliest. Managing the hotel tenants in an effective manner. Nowadays any modern-day buildings built with BMS to support facilities management to accomplish the maintenance and save the energy in building from one place of computers. monitoring and controlling connected equipment in the building. The alarm should be a popup in operator workstation for any critical faults in the system. Any types of equipment on, off status and alarm should be logged or stored in PC to retrieve later. Scheduling the equipment to on and off automatically by preset time. User interface graphics should be available in order to visualize the field equipment to monitor for BMS operator easily. HVAC (Heating, Ventilation, and Air-conditioning or all supply and exhaust fans, ACs etc). And any other system which has provision for BMS to control and monitor. Cables to connect sensors, actuators to DDC. Server to save the large database. TCP/IP– Transfer control protocols/Internet Protocol. HVAC System helps to facilitate and provide comfortable and healthy air conditioning to tenants. The lighting control system which has a variety of lightings in buildings that needs to be on and off effectively and save energy while tenants not available. Access control systems may also be used to control access into certain areas located within the interior of buildings. A fire alarm system is the life safety system to warn people by audio and visual to protect their lives from fires, smoke, carbon mono oxide and other toxic elements for the human. In case of fire Firefighting system aims to protect human life and property in the building by a large amount of water and other gas. UPS is to provide to the uninterrupted power supply in the building for electrical equipment. Pumping system used in the building to pump the water to the required area. still tons of systems evolved in the modern-day building to facilitate the people. all systems have its own controllers and processing system due to the different functionality of each system. 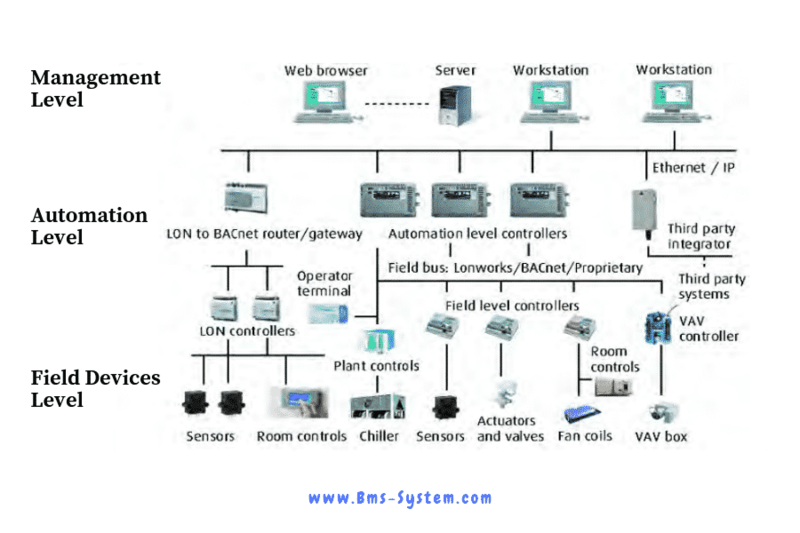 So BMS controllers or device designed for controlling and monitoring the HVAC system and other small systems and integrate all other systems through dedicated networking protocols like BACnet, Modbus etc. Management Level: This is the front end for operator and engineer used to visualize the graphics for controlling and monitoring the systems which have computer workstation, server, web browser, printers. Field devices Level: this is Level where BMS controllers connect to field systems sensors, actuators, and other panel circuits to monitor and control. Any modern day building client provides huge specifications for BMS System, whereas here I am going to take simple requirement to monitor and control the sequence of Air Handling unit. Let us see below the requirement of the client to monitor and control the sequence in BMS System. Before we go detailed about how to design the BMS System for the requirement. 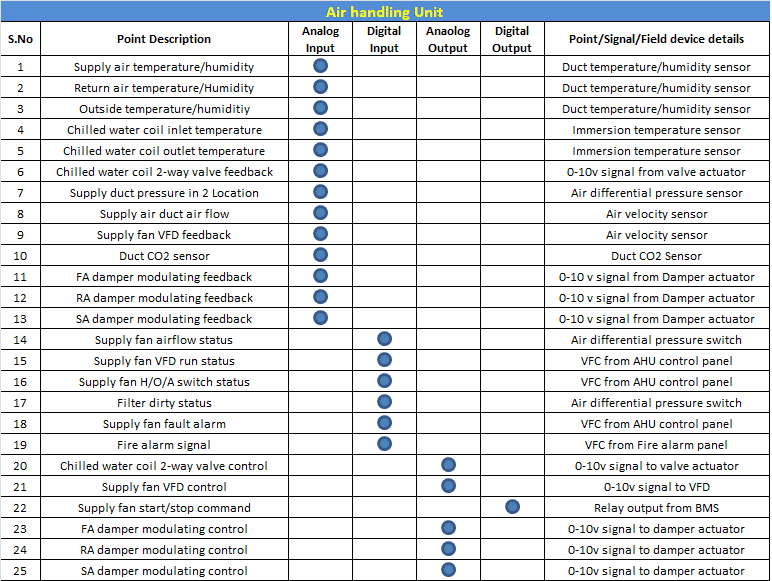 let us see some basics components of the AHU-Air handling unit. AHU is an HVAC system which consists of the duct, fan, filter, cooling coil, heating element,humidifier, sound attenuators, dampers, valves and many more to regulate the air into the room by heating, ventilation and conditioning to distributes the conditioned air through the building and returns it to the AHU and also called as centralised AC in modern-day building. Duct – It is the collection of metallic tubes that interconnected and distributes the heated/cooled air to the required rooms. In order to monitor the duct air temperature in fresh, return and supply duct. we have to install the duct temperature sensor in the duct. Fan Motor– Blower is used to circulate the air from fresh and return duct to the supply duct. Monitor the fan running status. Monitor the Fan motor overload fault status and many more. Filter– It is one of the main components in AHU to prevent the dust and dirt particles to enter in the AHU. DPS switch is used to install across the filter and provide a signal to BMS when the filter gets dirty(technically DPS-Differential pressure switch will send the signal to BMS when the pressure reached more than pre-set across the filter and this same function can be used to monitor the fan status. Heating/Cooling element- It is used to cool or heat the water that entered in the coil so that air in the duct can be heated or cooled based on the user requirement. Either heating or cooling water enters into the coils are controlled and monitored by valves on the pipe with help of valve actuator. Dampers- An HVAC damper is a movable plate, located in the ductwork, that regulates airflow and directs it to areas that need it most. damper opening and closing position controlled electrically with the help of damper actuators and this actuators have terminal for control from BMS and terminal to monitor the feedback of position. Software alarms shall be generated at the operator workstation whenever the run status of the supply fan (with differential pressure switch) does not match the current command state. A failure alarm shall occur when the run status of the load shows no operation and the load has been commanded to be on. An advisory alarm shall occur when the run status of the load shows operation and the load has been commanded to be off. All alarms shall be recorded in an alarm log for future review. Provide 15 seconds (adjustable) time delays before generating an alarm. 5) Once the above conditions are satisfied, AHU is enabled to start in Auto mode or using a plant enable button on the graphics in manual mode by the operator. Once enabled, BMS will automatically command supply fan to start. 6) Supply Fan shall start and it’s associated Interlock equipment in sequence. Through the signal from the Diff. Airflow Switch, if airflow is detected, the System will continuously run, if No airflow is detected by the DP Switch, the Supply Fan will de-activated and send an Alarm to the DDC – for “No Airflow” and shut down the whole system including its associated interlocks. If the Air flow switch signal is proved ‘ON’ then BMS will enable control loops. controller follows the following sequence. When the AHU is the manual mode, the fans are started and stopped from the AHU control panel. Other control except for fan on/off control shall function as per the Auto mode. Fire condition is determined by the Fire Alarm Control Panel. AHU will automatically shutdowns the whole system with associated interlocks. The supply air temperature installed in the duct will relay the measured signal(temperature) to the DDC controller, the DDC controller compares this signal with set-point (adjustable by the operator from BMS central) and generates an analog output to the 2-way modulating cooling valve. Based on the difference between the two values, a proportional-integral program will determine the percentage of the cooling coil valves opening to achieve the desired condition. The default set-point value for the supply air temperature is 13ºC (Adjustable). The supply air pressure sensor shall be installed in the duct will relay the measured signal (static pressure) to the DDC controller, the DDC controller compares this signal with the set-point (adjustable by the operator from BMS central) and generates an analog output to the variable frequency drive (VFD) of the supply air fan. Based on the difference between the two values, a Proportional-Integral program will determine the percentage of the fan speed to achieve the desired pressure. The set-point value for the supply air pressure for each AHU shall be adjusted. Demand control ventilation employs return air carbon dioxide controlling strategy. A single carbon dioxide sensor sense carbon dioxide concentration in the return air duct and sent to the DDC controller, the DDC controller compares the signals with return air carbon dioxide concentration (Default carbon dioxide level difference value 400 ppm ). Then DDC controller generates an analogue output to the outside air dampers and returns air damper to modulate, based on the difference between the values, the Proportional integral program will determine the percentage of the modulation of outdoor and return air dampers. Minimum outdoor air quantity shall be governed either by building pressurization requirement (Input from Building differential pressure sensor) or 20% of the Maximum outdoor requirement of the AHU. 1) Filter Dirty Alarm: This is generated when pressure drop on each filter exceeds the set value to indicate dirt accumulate at filters. supply fan is not giving the signal according to the command due to any reason then alarm shall be generated. In case of a fan fail alarm on the BMS, due to abnormal behaviour, the DDC controller will latch the alarm. The operator has to acknowledge (reset) the alarm on the BMS once the trouble has been checked and removed. The operator shall not be able to start the AHU until the alarm s acknowledged and reset. 4) Temperature High & Low: Temperature HIGH and LOW alarms shall be generated if the supply/return air temperature rises above or falls below the supply /return air temperature alarm limit. Digital Input: It allows a microcontroller to detect logic states either 1 or 0 otherwise called as VFC-Volt free contact. Analog Output: In automation and process control applications, the analogue output module transmits analogue signals (voltage or current) that operate controls such as hydraulic actuators, solenoids, and motor starters. Binary Output: it is nothing but relay output from the controller to trigger on and off any equipment. Now its time to choose the DDC controllers based on the above input and output point list. Any BMS controllers manufacturer must have the basic controllers types of analogue input-output, binary input, and output controllers either dedicated controllers or mixed of all types in a single controller. Once controllers are designed, we need to calculate power load for each controller (available in controller datasheet) and field devices to choose the right transformer rating for our DDC panel. First, we need to change English words into the flowchart then we can change it later on the different programming language that required for BMS vendors either ladder logic or functional block or plain English and etc. whatever it is any BMS program functionality that will not go beyond the basic digital logic gates. Please leave a comment if have any doubts. Thanks you for making this easier. Explained in the best way ! How does DPS value change from NO to NC while using for Filter and air flow status requirements? DPS-Differential pressure switch triggers NC to NO when the differential pressure across the positive tube and a negative tube is greater than the pressure range set on the DPS. For Fan, DPS Pressure tube connected after the fan and negative tube connected before the fan in order to identify fan running condition, when fan starts to run, the pressure will be high in positive side and lesser in negative where DPS differential pressure will be greater than the negative side and triggers the contact from NC to NO. For Filter, we need to install positive tube before filter and negative tube in after filter or the opposite of fan because we need to signal from DPS when the filter gets dirty or technically we need signal across filter when pressure builds up before the filter more than DPS setting range. Anyhow, let me post separate post to explain both scenarios in a better way with the graphical presentation as soon as possible. if you want to know how DPS triggers NC to NO when pressure build-up across the positive and a negative tube. we can also get this by only connecting the positive tube right? Also we will get the filter status dirty(the filter has become dirty) only while fan is running? once the fan stops, it will go back to clean status right? But filters we need to connect both sides to get actual signal of filter dirty. Thanks for showing the sequence operation of Ahu in detail and now show us how the termination is done in DDC panel for Ahu and which cables,controller and protocol use for the Ahu . Mr.hamza, i dont know , which word i can use, for appreciate u. This is very very useful for the begenners , who looking for learning BMS, may allah bless u, ur presentation is very good, and can understand easly. Waiting for ur next post. Thank you for your words nishad. What is DDC or Direct Digital Controller in BMS System?